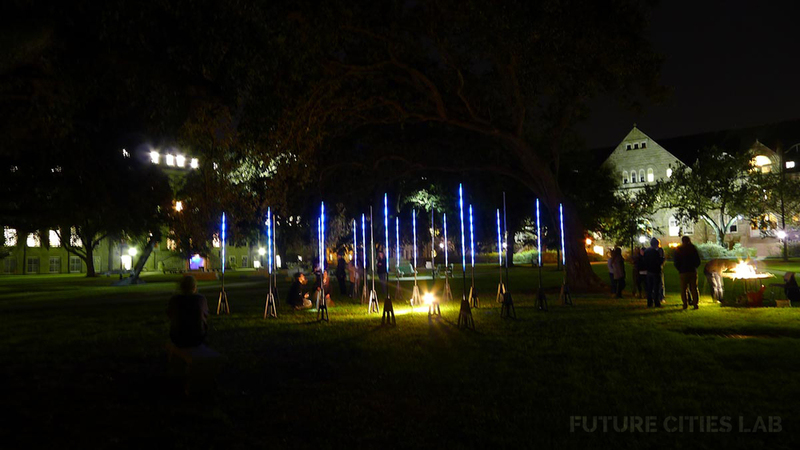 Working with Tulane University students over three days, we fabricated and deployed a 32' x 32' x 9' tall 3D matrix of 875 individually addressable RGB LEDs. The intent was to create a platform for dynamic spatial experimentation: luminous forms that can be generated by a variety of static and dynamic inputs including real-time sensor data, social media inputs like Twitter, and connecting the light matrix directly to CAD (using the Firefly for Grasshopper plug-in) or related programs to simulate a range of forms, patterns and more. 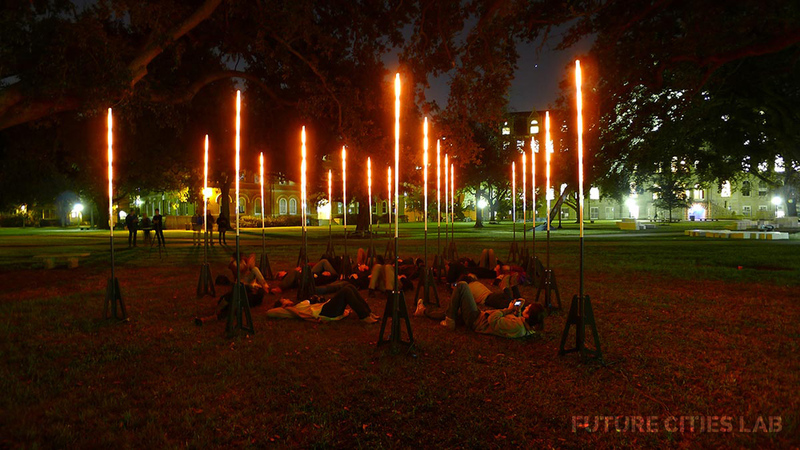 Vertical light quills were fabricated and installed in the Gibson Quad at Tulane opposite the School of Architecture. Location: Tulane University, New Orleans, LA. Image 01. The 5x5 light grid can be evenly spaced (as pictured above) or arranged in a more random fashion (see Image 2 below). This is a preliminary list of the modes we experimented with using the Luminous Forms installation. 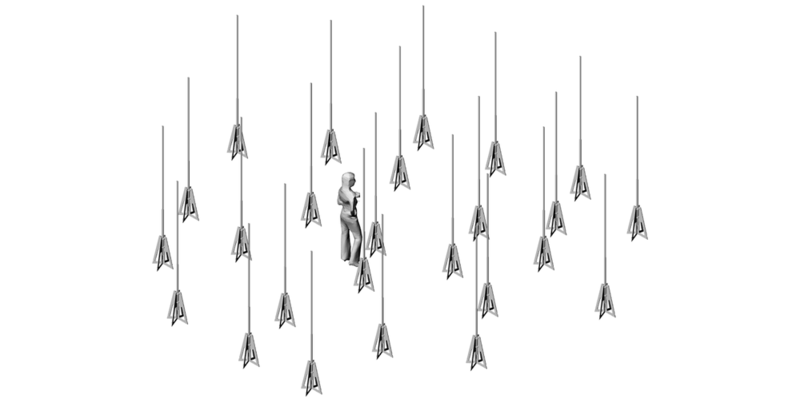 Small groups of 5-6 students developed a mini-project that explored one of these unique modes of input combined with a specific light quill arrangement. Image 2. Random or clustered arrangement of the 25 vertical light quills. Image 03. 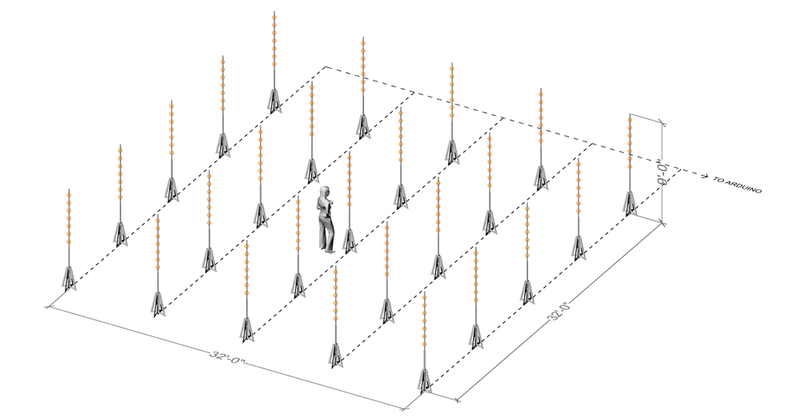 Each ball in this diagram represents 5 uniquely addressable RGD LED lights. These can be controlled on/off or dimmed to create a range of static and dynamic "luminous forms". Specific points, lines, planes and volumes can be defined within this 3d field. Image 5. To build the light quill "quadpod" stands we'll be milling four 1/2" thick 4x8 MDF sheets.